Your official author photos will become one of your most-used assets throughout the publishing process, from publicity to production. In this article, we offer tips on how to get good, multi-purpose author photos. Author photos vary from one author to another, and they should—each photo is a representation of the person in front of the camera. But the style of the photo can also nod to your work’s genre and age category. For example, a nonfiction business expert could be dressed in a suit, while a children’s author might wear a more casual outfit. A psychological thriller author might have a serious expression, while someone who writes humor would smile or laugh in their headshot. Think of a few comparable authors in your genre and category, and take a look at their photos. Are they relaxed at home, posed with a cup of coffee, or against plain white backgrounds? Do you notice trends in outfits or expressions? Take note of which you like best. And finally, think about what represents you as a person, not just as an author. If it’s unnatural for you not to smile in photos, don’t force a “serious author look”—being your authentic self is often more important than conforming to genre norms. It may seem silly or unnecessary, but practicing your pose and doing a dress rehearsal in front of a mirror can help ease your nerves and maximize the precious time you have with the photographer. Have a friend take practice photos of you and give you direction. For shots where you’re smiling, practice fake laughter. Many photographers will prompt you to smile, but natural smiles are hard to fake on command—unless you force a laugh. For serious poses, memorize the expressions that work for you. Raise your eyebrows, lower or turn your chin, smirk and look off camera. Use this time to practice whatever poses you want! Practice your preferred makeup style, if any, and try on the outfits you want to wear. Once you have an idea of the pose and style of photo you’re going for, work with your photographer to figure out the best setting. Photographers usually have a variety of flash options, as well as their own preferences for lighting. If you’re not working with a professional, make sure the space—whether outside, in a studio, or in your home—is well lit. This can include waiting until the sun is at a certain angle or moving lamps to give you the best light. Remember, lighting and image quality go hand in hand. Take multiple photos for each pose, varying your expression. If you have time, try multiple outfits. If you wear glasses, take photos with and without them—and take note that your photographer can usually edit out any glare! Take full body shots as well as close-up portraits. Try various casual sitting positions. Look directly at the camera for some shots, then look off to the side for others, keeping in mind where the light will hit your face. Be open to direction from your photographer, who can see what’s going on behind the lens. If they have an idea or suggestion, go with it! Though you may only choose one “official” author photo, you can use others for a variety of platforms: social media, websites, newsletters, appearances, advertisements, and more. So make sure to keep them all. One challenge many publishers face is how to use low-quality author photos for certain purposes. 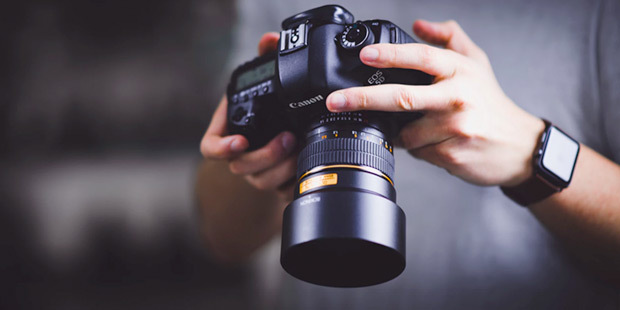 If your photo appears on the back of your book, for example, a blurry or pixelated shot won’t capture readers as well as a crisp, high-quality image. For photos that have been posted online, always send the original file, not a version copied from a website. If you use a photo from Facebook, for example, that photo has been reformatted and compressed. Your original file will always be a higher quality. Some authors use photos taken of themselves by a smartphone. While our publishing teams don’t recommend this, if the phone’s camera quality is high, these images may work. Make sure to send the full-sized image by attaching the photo to an email (as opposed to inserting it) and sending it to yourself. Make sure to open the image on a computer to check the photo quality at a larger size before you send it to your publishing team. Author photos are a necessary step of the publishing process. They might not come naturally to everyone, but that doesn’t mean they can’t be exciting. Try to relax and have fun with it!